Mindy and Megan Earnest are fraternal twins who could easily pass for identical. 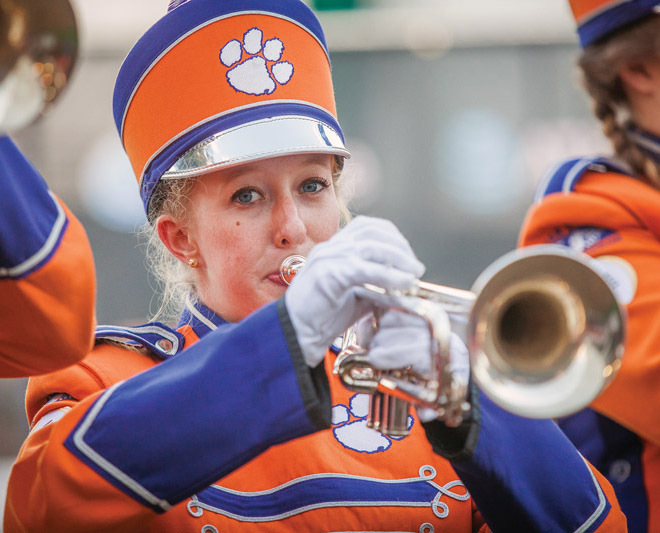 Both are engineering majors in the Calhoun Honors College and active in Tiger Band. It’s easy to see how people get them confused — just ask some of the people who have mistakenly had a conversation with one sister expecting her to be the other. 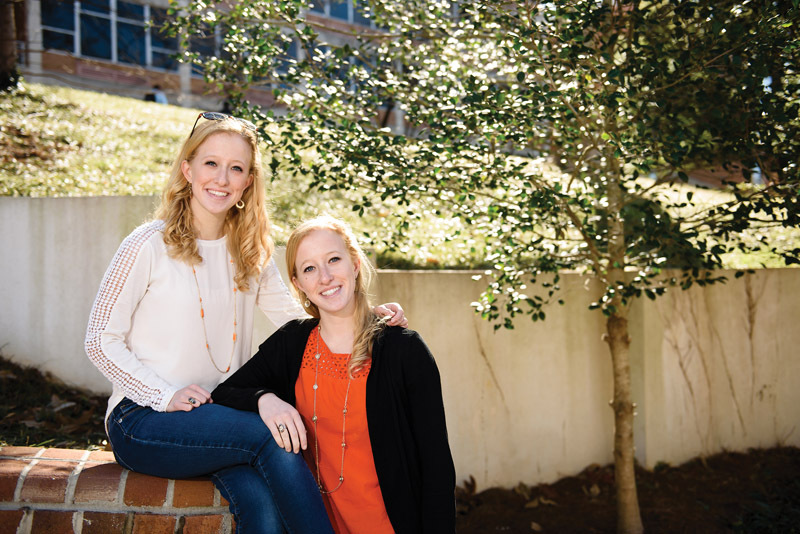 Hailing from Knoxville, Tennessee, Mindy and Megan both chose Clemson for similar reasons but avoided talking about it before making the big decision. “We announced our final choice at the same time so we didn’t influence each other, but we were also looking for the same things in a school, like a good college town and a nice campus feel. Clemson fit both of those,” said Megan. Still, the twins went different ways when it came to declaring their major concentrations after freshman year. Mindy, more math minded, settled on electrical engineering, while Megan chose industrial engineering, which offers a more business-focused approach. After completing co-ops at different engineering companies, both sisters say they plan to pursue careers that center on research. And if possible, they’d like to wind up living close to each other. But like many soon-to-be college graduates, they both feel confident in going wherever a job may take them. In music, as in academics, the things the Earnest sisters share are also the things that distinguish them: Mindy plays the trumpet and Megan the piccolo. And while many people with siblings may find it hard to envision spending so much time with a sister or brother, the Earnests see their shared time as a helpful advantage. “There’s always someone to keep you accountable. Back when we were in the same engineering classes we always had someone there to do homework with and ask questions,” said Megan. Mindy quickly echoed the sentiment. “There’s always someone there who thinks more like you. It makes it easier to explain concepts to each other,” she said, even when they’re working in different subjects. Freshman year was a hallmark one for Mindy and Megan, and not just because it was the last time they took a class together. 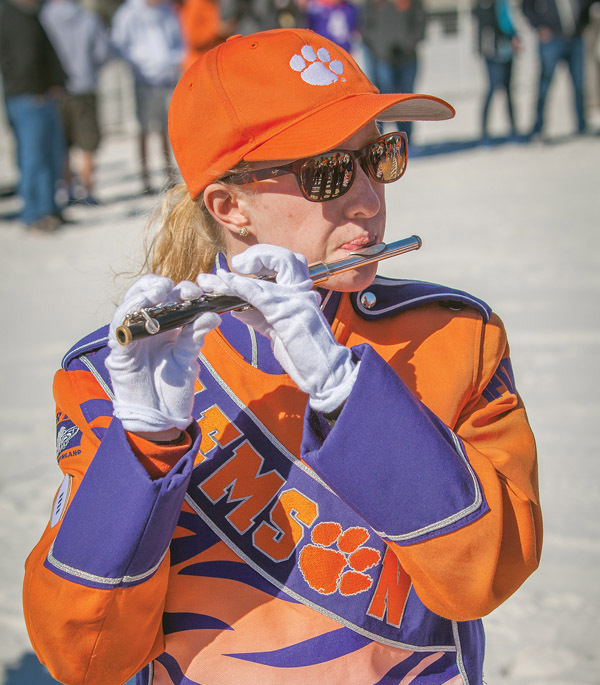 It was also the first time they took the field with Tiger Band. Music has always played a large role in the Earnests’ lives. But both sisters agree the best part about Tiger Band isn’t musical, but rather social. “There are so many people in band that I don’t even see Mindy during practice,” said Megan. “It actually works out well because you get to expand your friend groups. She found hers, I found mine, and then we combined them,” Mindy said. From the big decisions to the smaller ones, the sisters (who are also roomates) seem to be constantly in sync, even unintentionally choosing the same outfit from time to time. According to Mindy, “Whoever comes out first gets dibs.” Agreeing on everything from their favorite spot on campus (the amphitheater) to their favorite Clemson restaurant (Yolk Asian Kitchen), Mindy and Megan are proof that being able to manage heavy engineering course loads, maintain high GPAs in the Honors College and participate in a demanding extracurricular activity is more possible with a good support system in place. Just be careful — if you run into one sister and mistake her for the other, she probably won’t correct you. “I’ll be walking on campus and hear Megan’s name and think to myself, ‘I should probably just answer,’” says Mindy. Megan agrees. “Sometimes one of Mindy’s professors will think I’m her, and I’ll just listen. Then when I get home I’m like, ‘Hey Mindy, here’s what they said. You might want to talk to them.’” Now that’s love.